Placing a conservation easement on a property is a process—similar to carefully purchasing real estate and requires planning and coordination. 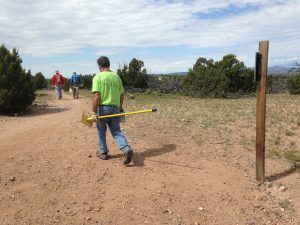 Generally speaking the process can take from three to nine months to complete; and approximately three months longer if the landowner is applying for NM state tax credits. Often the decision of placing a conservation easement on your property is a family matter. Discuss the implications of an easement with the concerned parties and determine if a consensus can be reached. Consult with your financial advisor early and throughout this process to determine the federal and NM state tax benefits of completing a conservation easement and how that fits in with your estate planning. Contact a title company and request a Title Commitment, which will allow you and SFCT to determine if there are any title complications that need to be cleared up. When we complete the project, SFCT requests title insurance in the amount of value of the conservation easement. If you have a mortgage on your property, SFCT will require lien holder to subordinate the mortgage to the conservation easement. SFCT will provide documentation to bank and guide you through the process. At the same time you request a Title Commitment from a title company, ask the title company to run a Mineral Right search for you. If you do not own all of your mineral rights you need to contact a qualified geologist to receive a “Mineral Remoteness Letter”. This letter indicates that the owners of the minerals are highly unlikely to mine their assets because the likelihood of mining is “so remote as to be negligible”. If you cannot obtain a Mineral Remoteness Letter you will have to exclude that portion of your property where the mineral rights are severed, or if the severance encompasses the entire property, SFCT will not be able to complete a conservation easement with you. Do not make the mistake of thinking that all attorneys and financial advisors know the intricacies of conservation easements. Seek professionals who are knowledgeable about this subject. It will save you time and money. SFCT has a list of local professionals we have worked with in the past that we can provide you with. The staff at SFCT can provide you with a list of the documents that we will need copies of, such as legal descriptions, deeds, surveys, water rights, title insurance etc. to complete the process. It is best to get as much of this done as early in the process as you can because many of the other steps will need this information. Work with the SFCT staff to create a list of permitted activities and restrictions that are often addressed with conservation easements. We have a questionannaire to help guide through the activities and restrictions. Although you will need a full appraisal to complete a conservation easement, you may want to get a preliminary appraisal that will enable you to sit down with your financial advisor. Seek a NM state certified, experienced appraiser because this transaction will have to stand up to IRS standards and can have dire consequences if it doesn’t. We have a list of professionals we have worked with in the past. Contact a biologist to complete a “Baseline Document” (also called a Present Condition Report). Through narrative, maps and photos the Baseline Document establishes the present condition of the property when the easement is put on it. It is required by the IRS and serves to: 1) demonstrate to the IRS that there are significant Conservation Values on the property, and 2) be the benchmark against which any violations of the terms of the conservation easement are measured. We have a list of professionals we have worked with in the past. SFCT has a boilerplate conservation easement document. However, each easement is tailored to the desires of the landowner and the needs of the land. You, your attorney and the staff at SFCT need to work together to create mutually agreeable terms for your conservation easement deed. This deed may need to be passed back and forth several times to produce the final product. We want to ensure that the land and the landowner are happy with the final deed. A complete appraisal is required in any case where tax benefits are sought. The IRS requires that a complete appraisal be filed with any conservation easements valued at $500,000 or more. It is very important to tell your appraiser that the appraisal must be done within 60 days prior to the donation of the easement. After all parties (landowner, SFCT and both parties attorneys) agree that the terms written in the conservation easement are acceptable, and all due diligence is complete, the deed is ready for filing with the County. The conservation easement document must be filed in the County Clerks office of the county where the land is located. SFCT will provide this service for you or your attorney may wish to file. Complete the process with your financial advisor to file the appropriate forms and financials to receive potential Federal and State tax benefits.